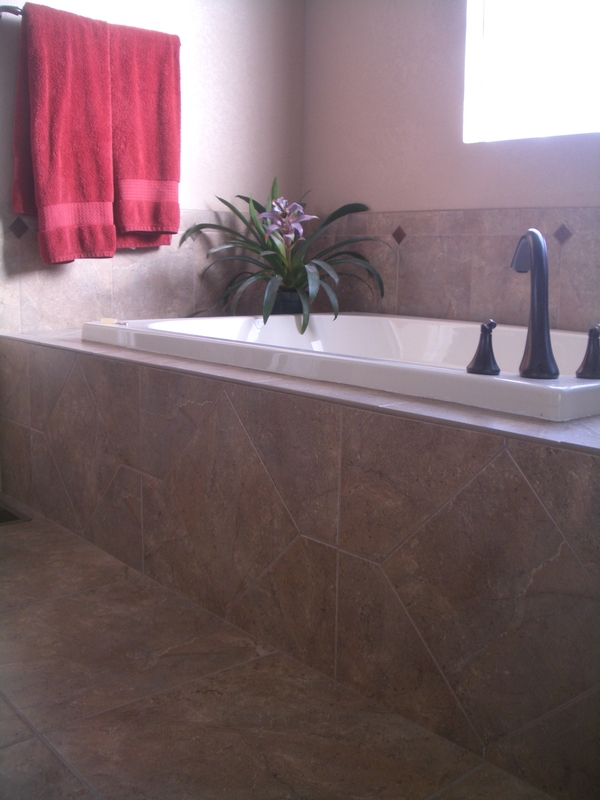 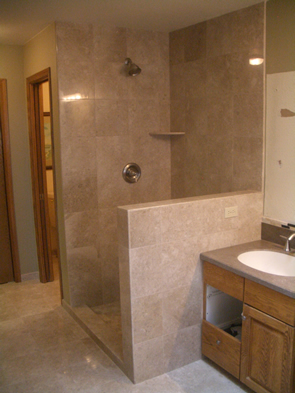 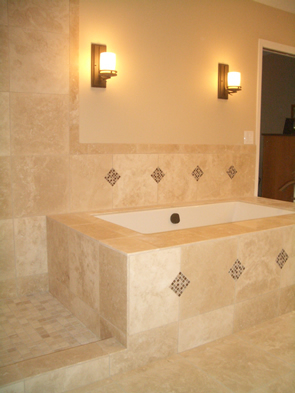 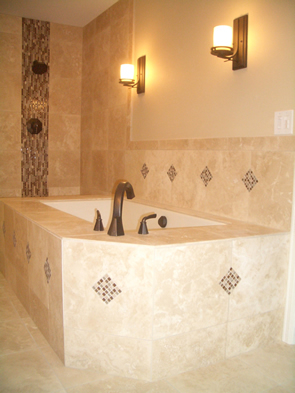 I’ve recently completed a full bathroom remodel in Fort Collins, Colorado. 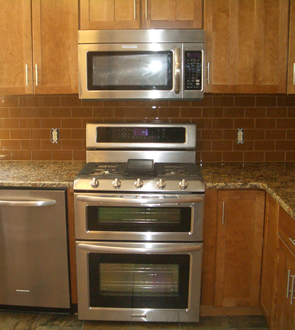 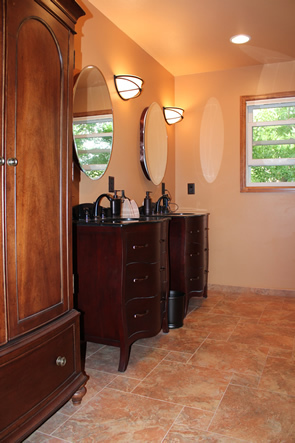 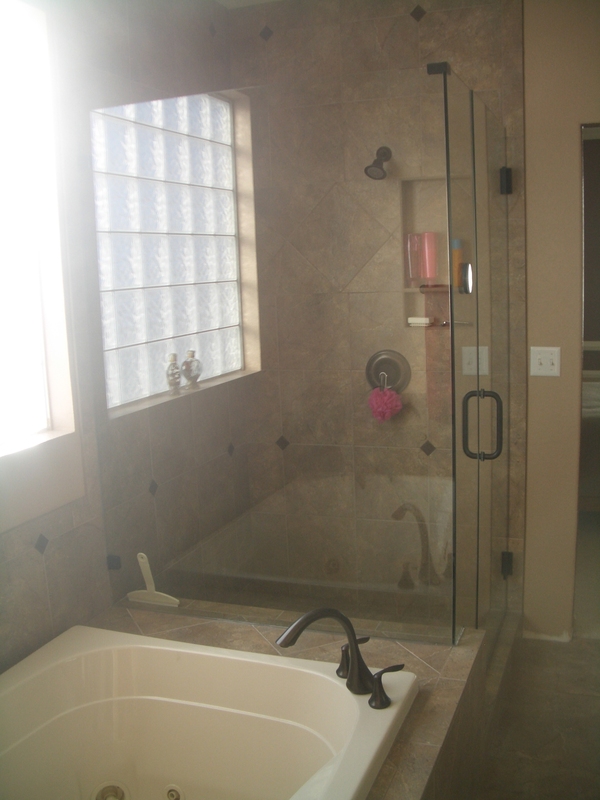 The remodel included a full standing shower, jacuzzi tub, floor, vanity top, and backsplash. 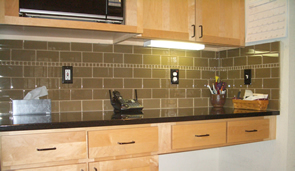 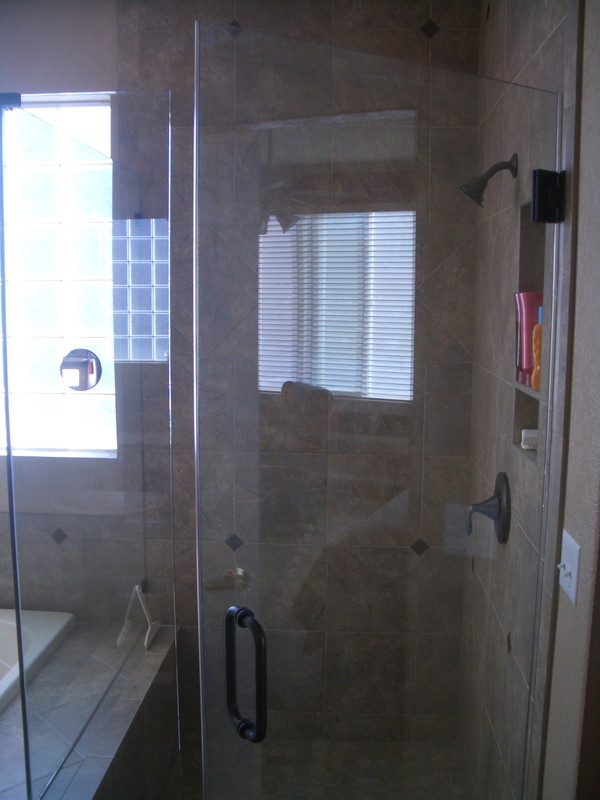 The project began when the homeowner discovered a leak in the existing shower bench. 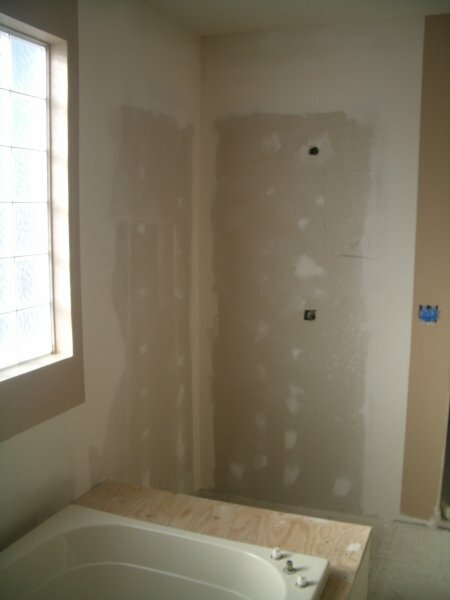 Improperly (or non-existent) waterproofing on the shower walls and bench led to a leaking bench corner which compromised the entire installation. 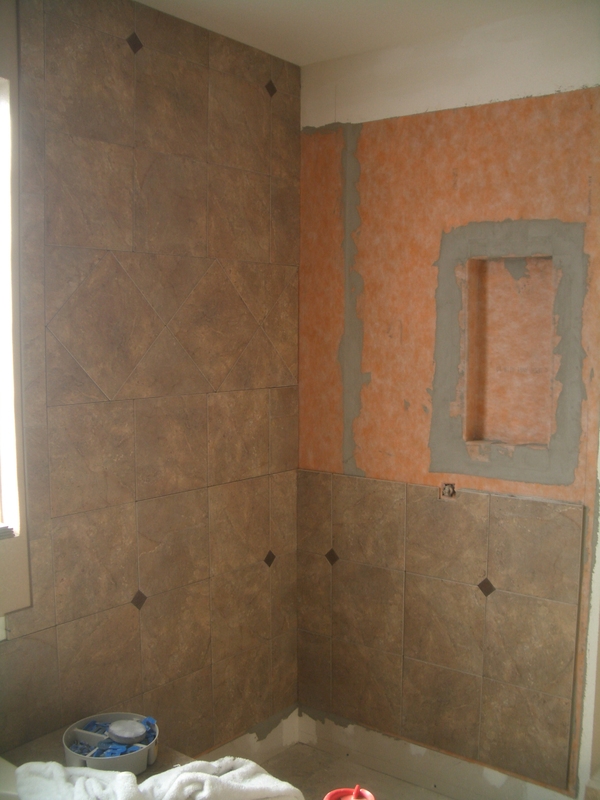 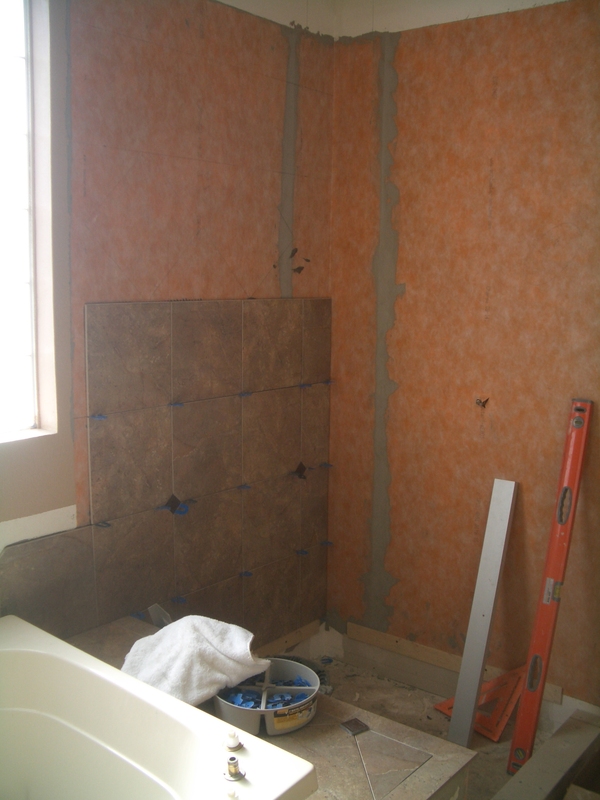 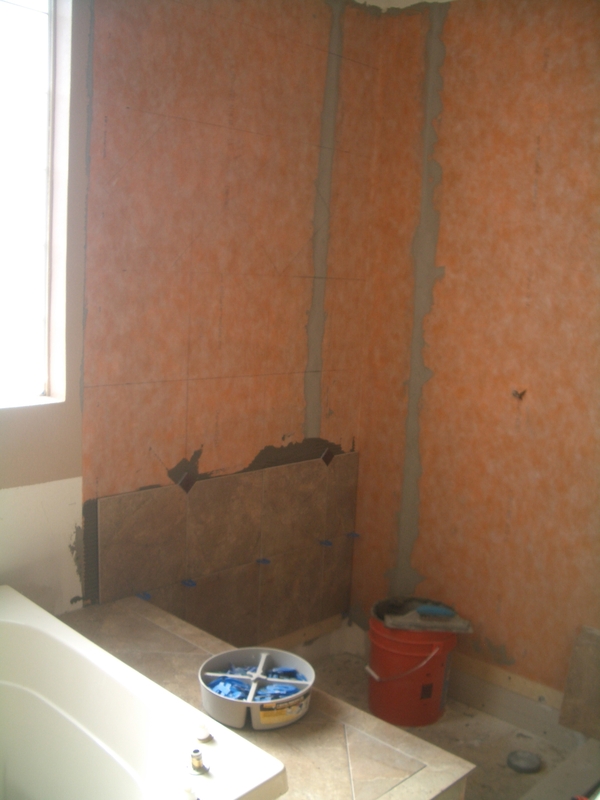 The bathroom was remodeled using all Schluter materials. 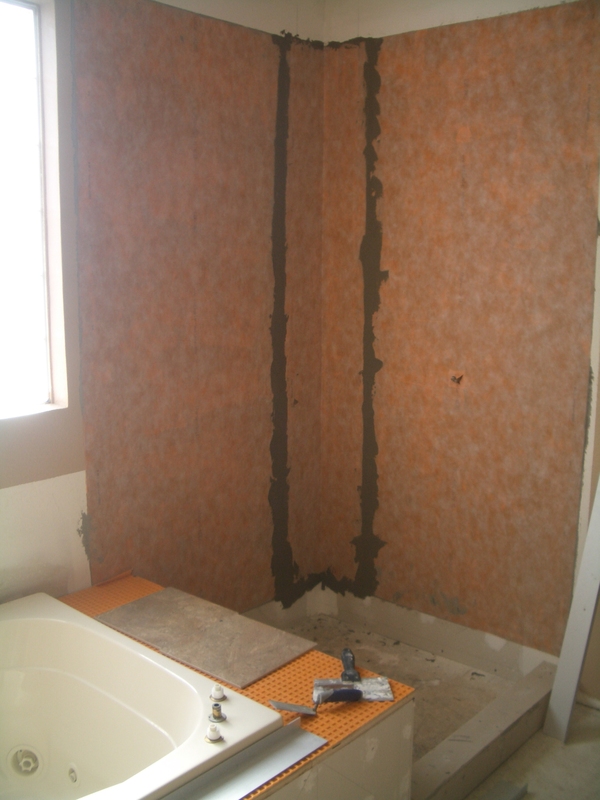 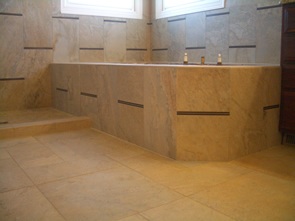 Schluter Kerdi was used for the shower and the flooring underlayment is Schluter Ditra. 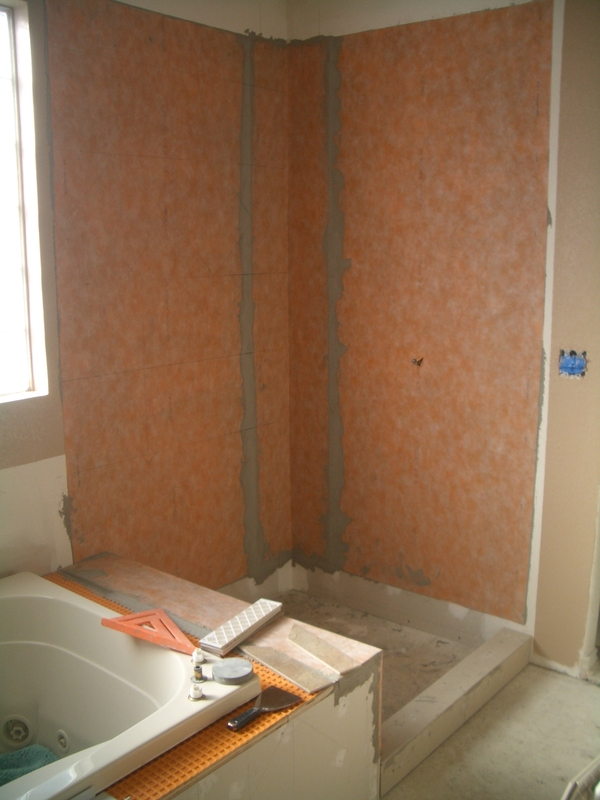 Kerdi is a waterproofing membrane which can be used for anything from waterproofing a window all the way up to and including the entire shower system. 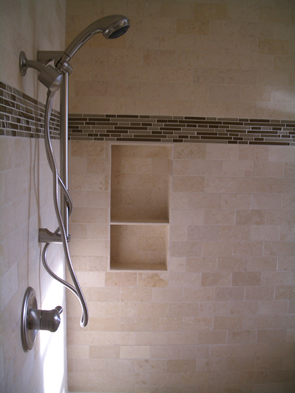 In this case the entire shower from the drain up was built with Kerdi. 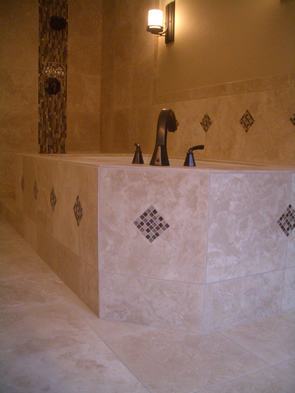 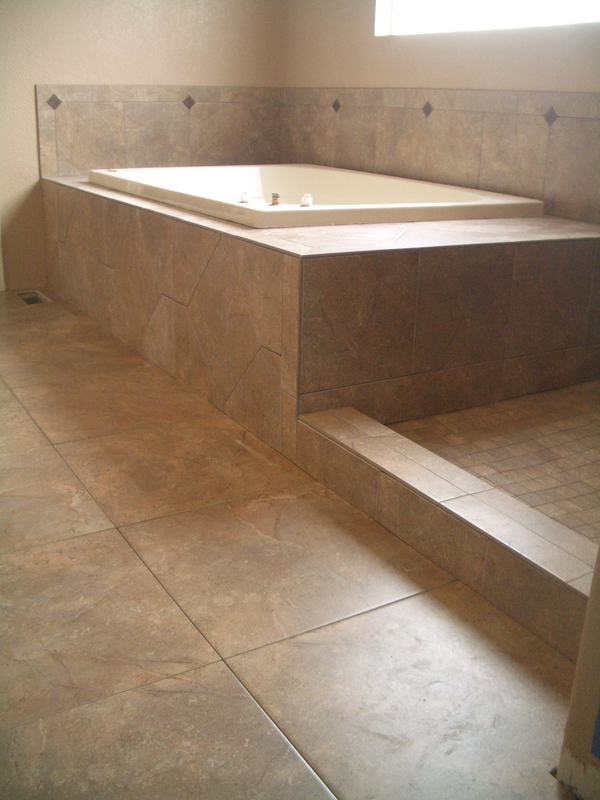 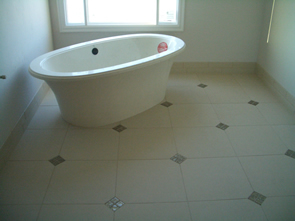 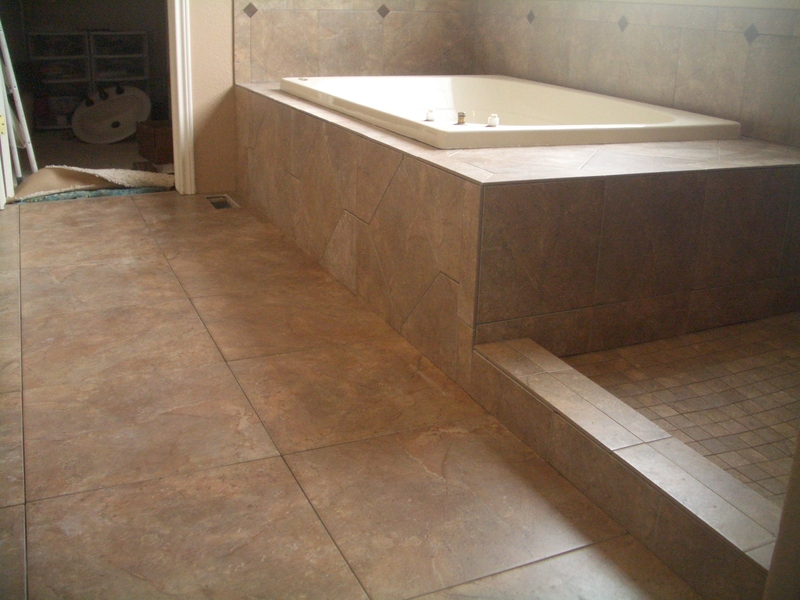 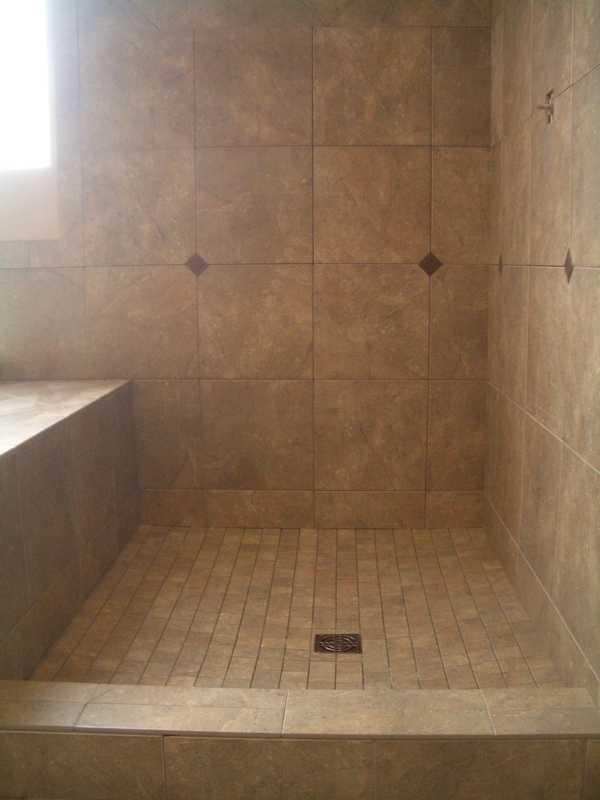 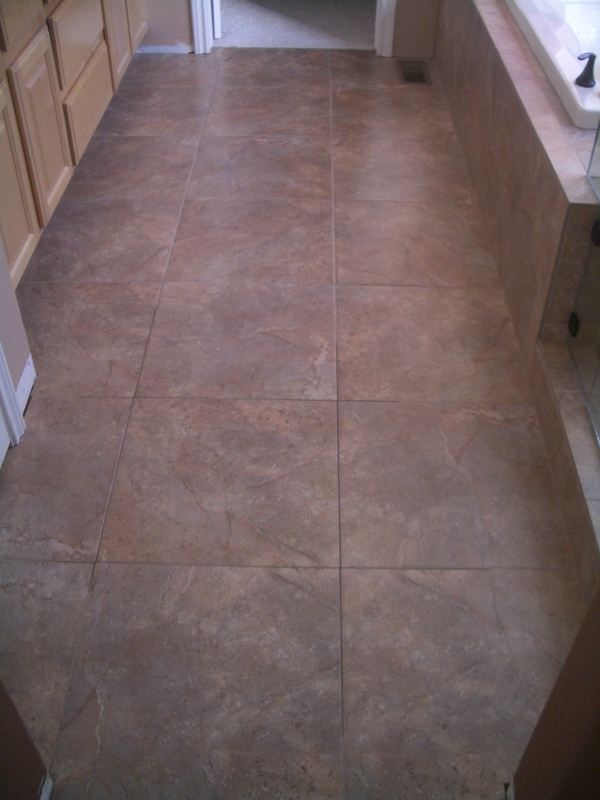 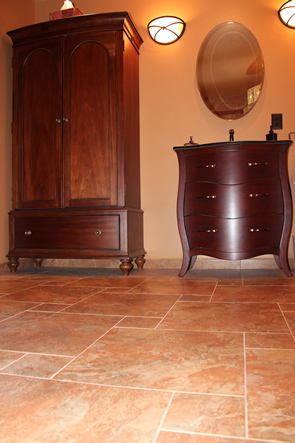 The tile chosen for this bathroom was Florida Tile’s “Livingston Leather” in 13 X 13 inch for the shower walls and tub deck, and 19 X 19 inch tiles for the floor. 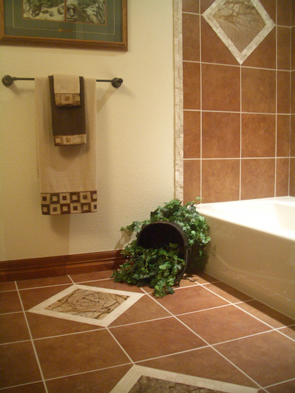 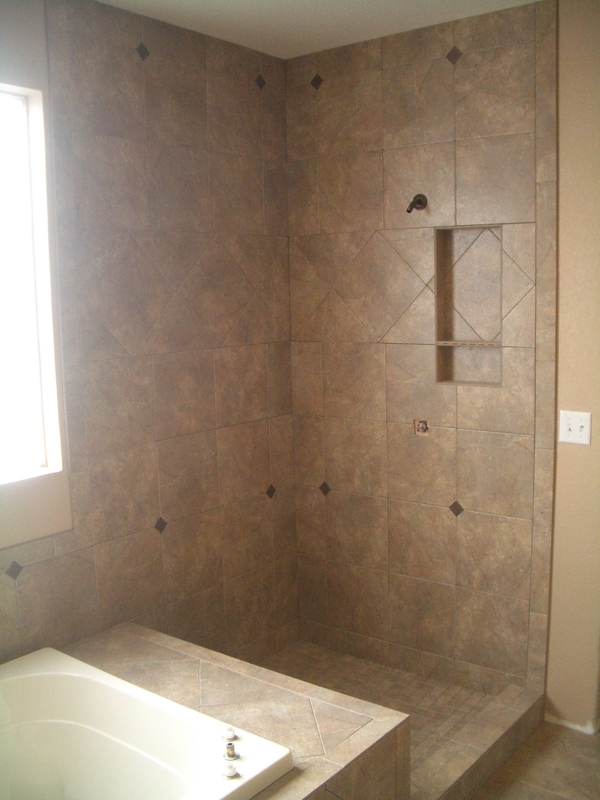 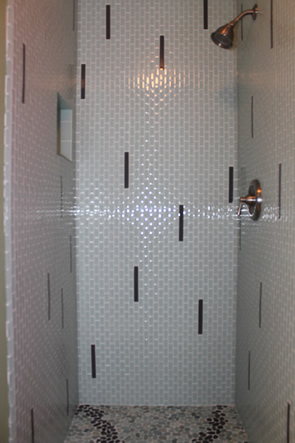 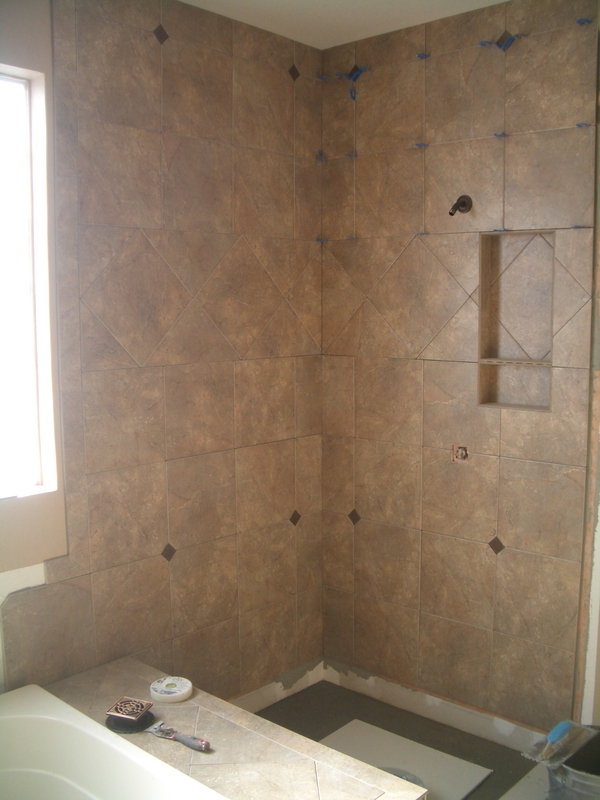 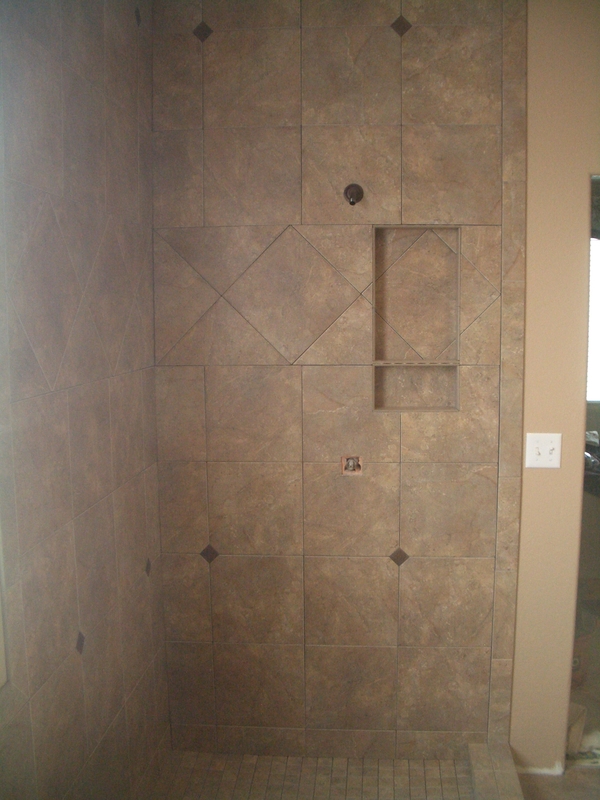 Matching 2 X 2 inch mosaics were used on the shower floor. 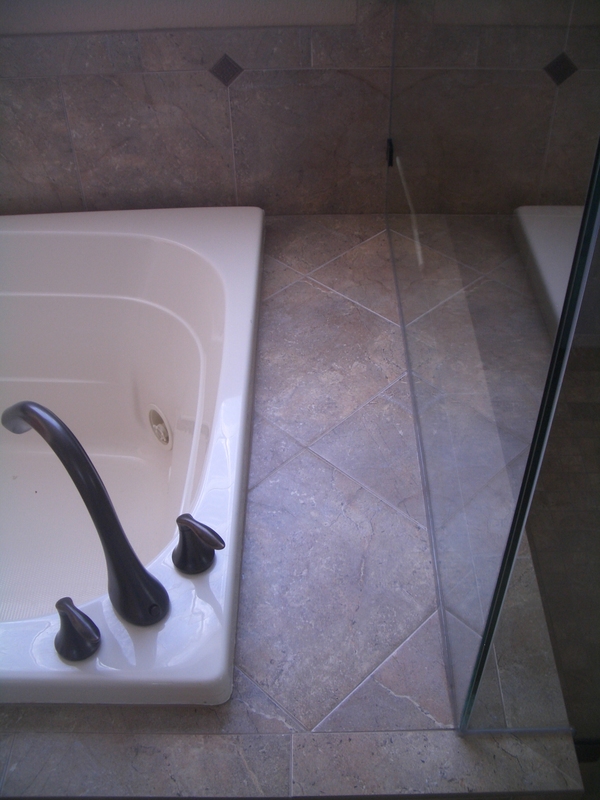 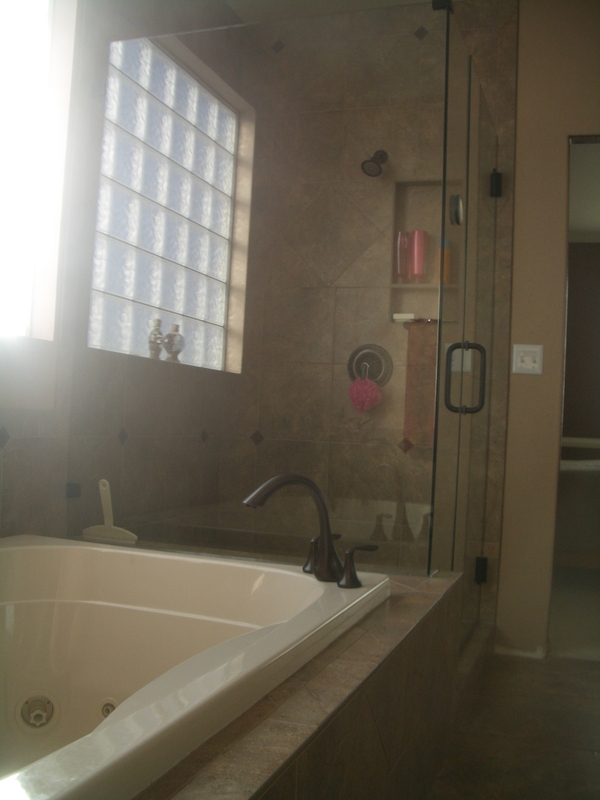 All the existing fixtures were replaced with oil rubbed bronze as well as the hardware on the frameless shower glass and the Kerdi drain finish. 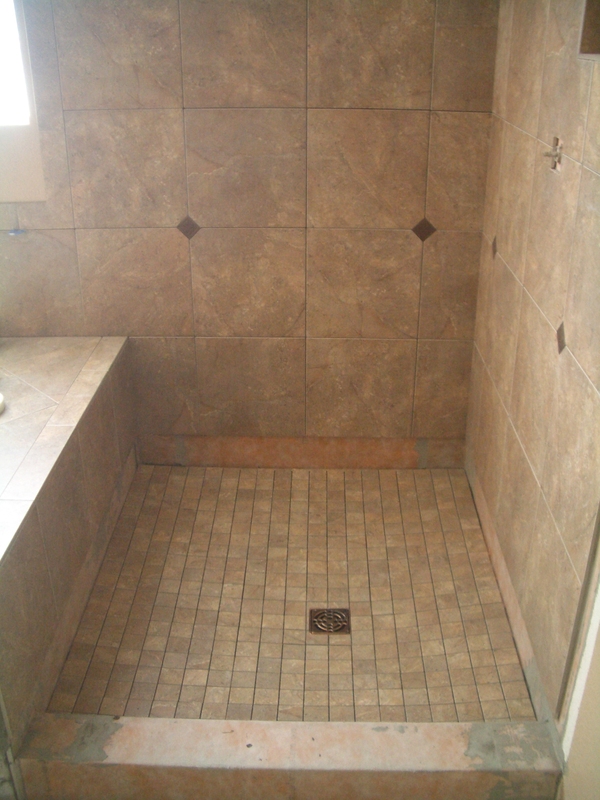 The oil rubbed bronze matches and compliments the tile quite well. 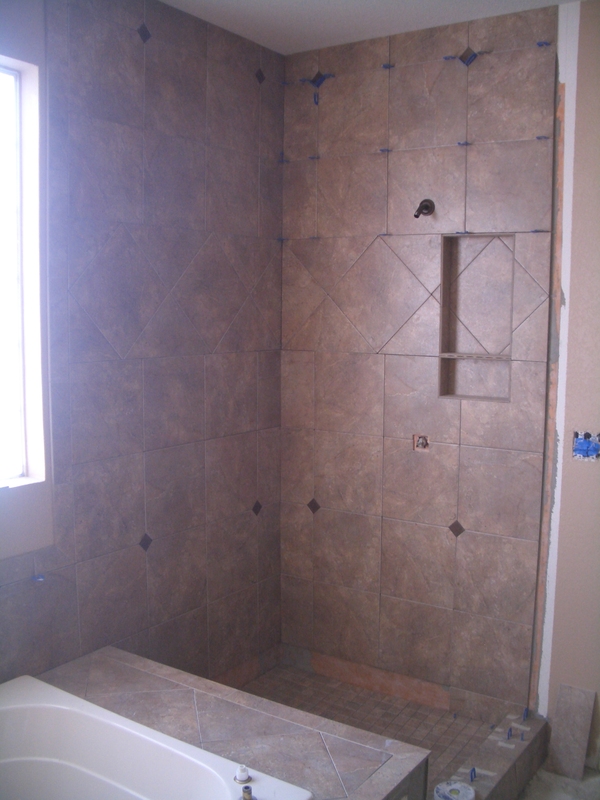 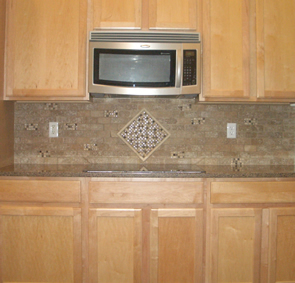 Small square bronze inserts were also added to the tile. 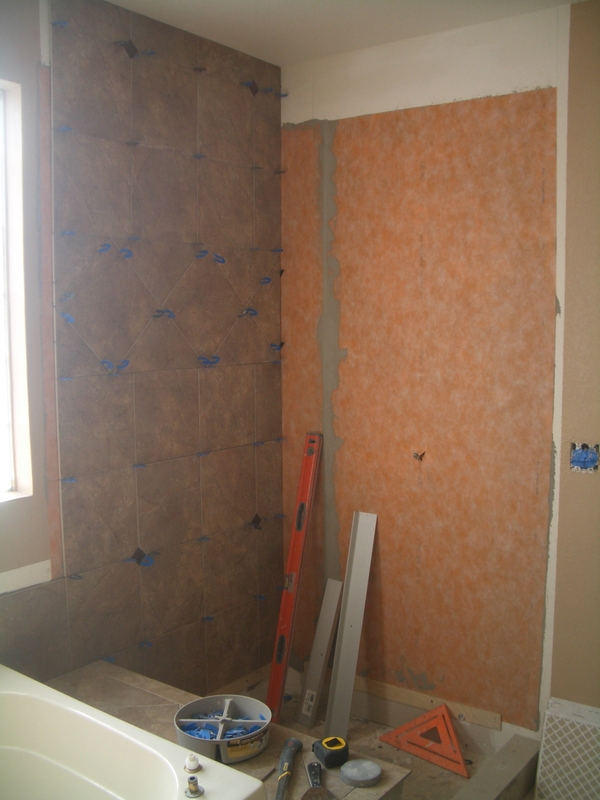 The homeowner actually did the substrate prep for this remodel. 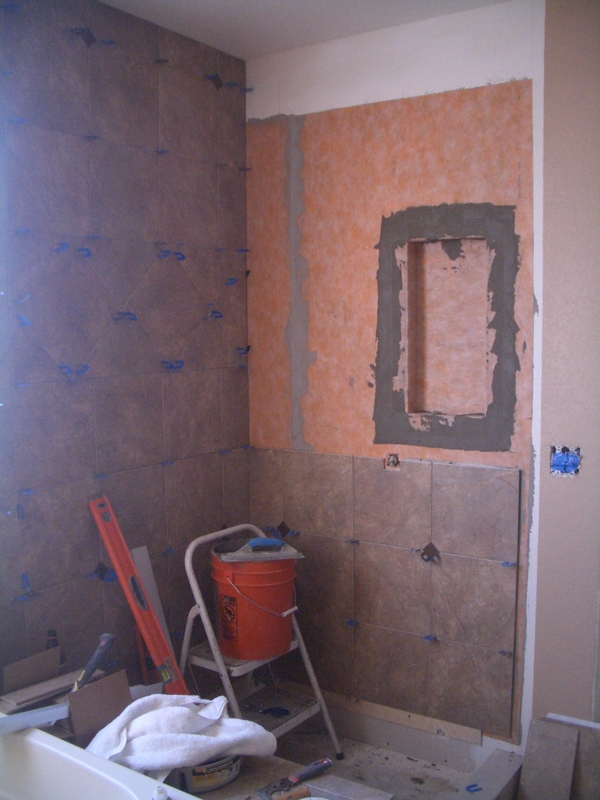 She – that’s right, I said she – removed all the existing tile and walls around the shower and replaced it with drywall for the Kerdi (drywall is the recommended substrate for Kerdi). 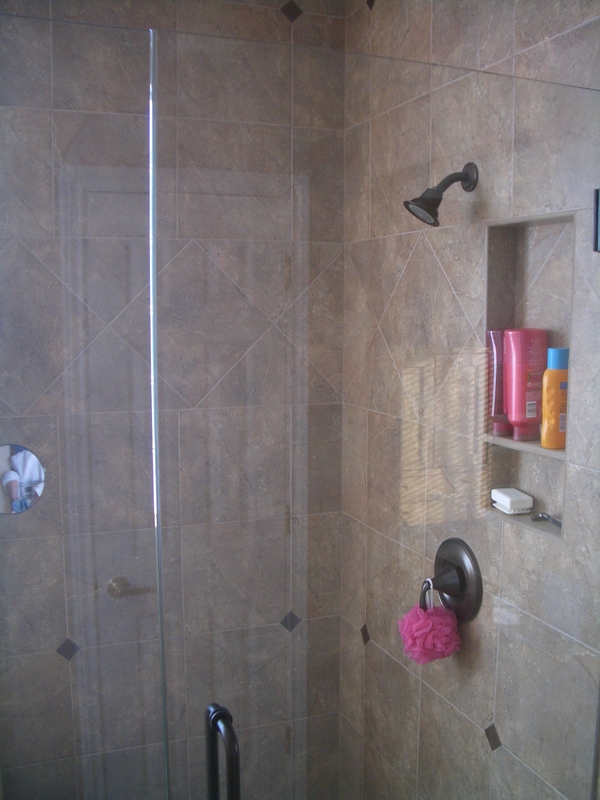 She also moved the tub back toward the wall about a foot to increase the size of the shower and create a ledge inside the shower. 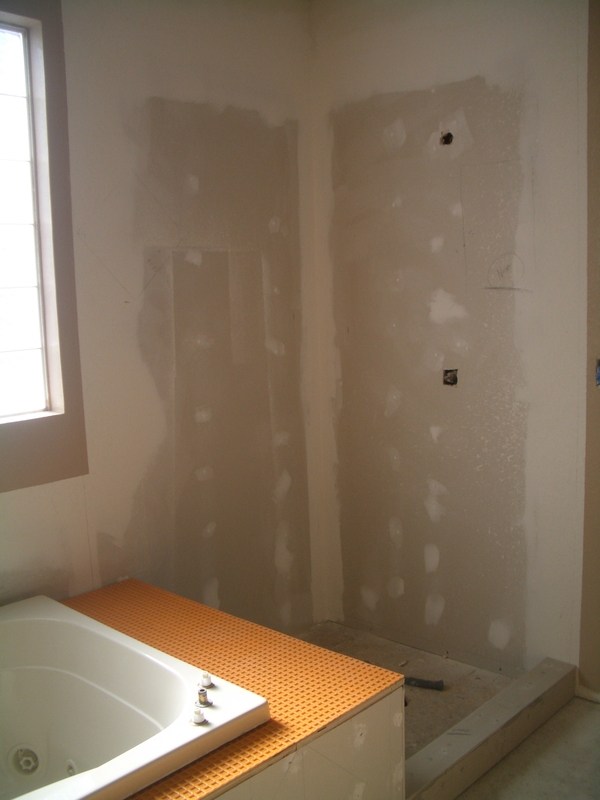 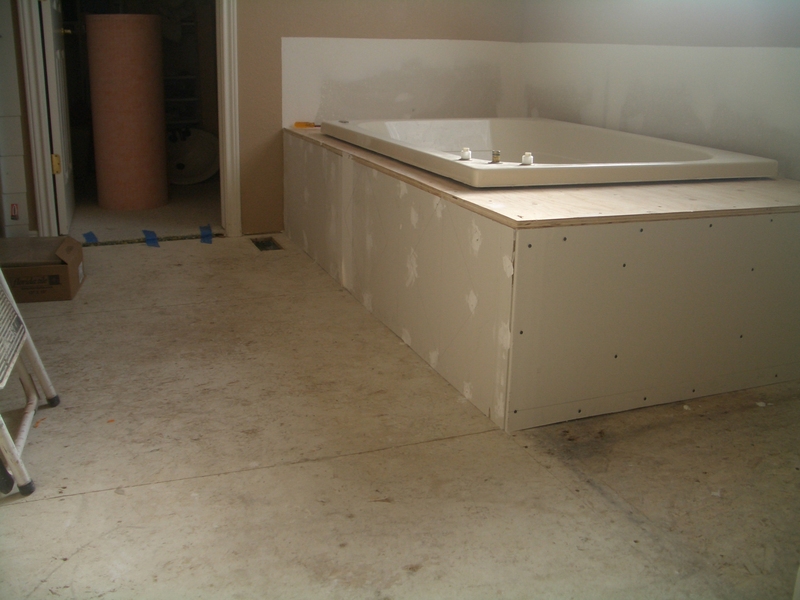 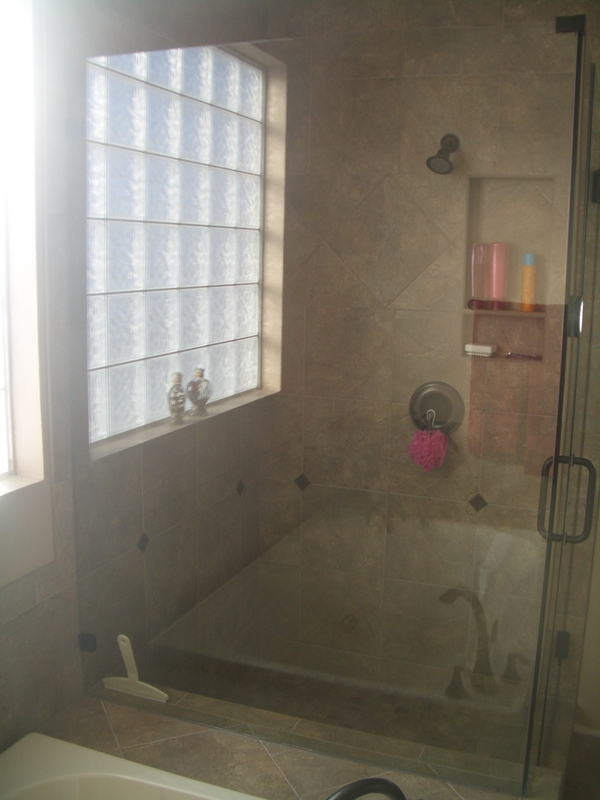 By removing the existing shower bench and moving the tub back the size of the shower was tripled! 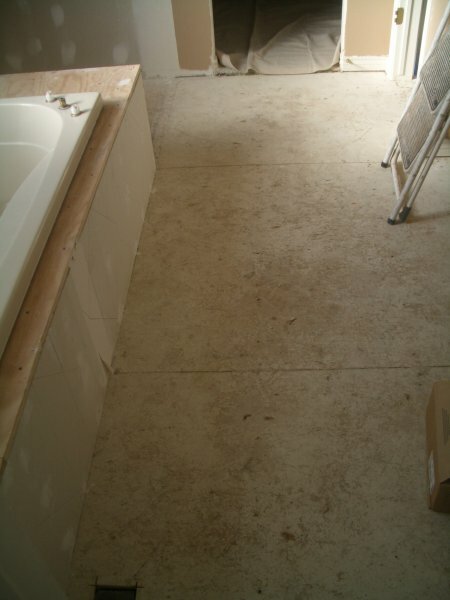 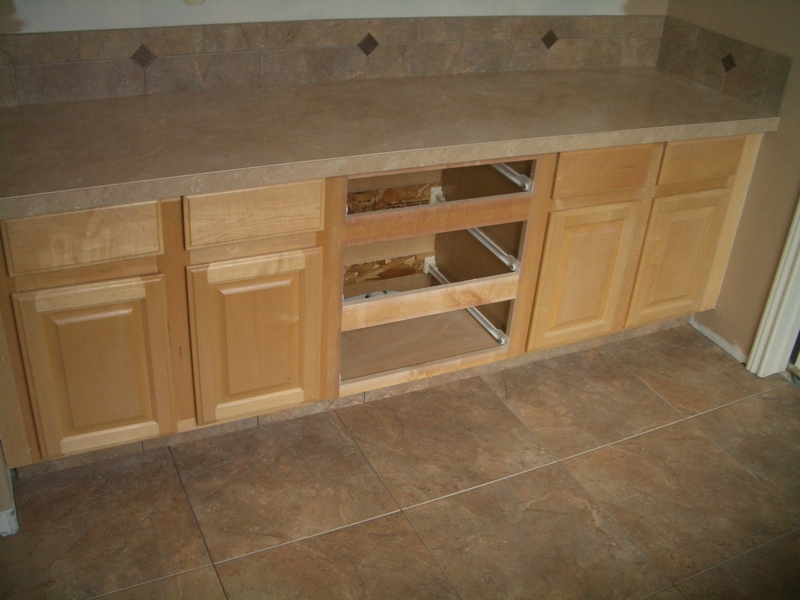 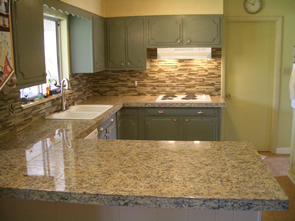 She also removed the existing flooring and countertop. 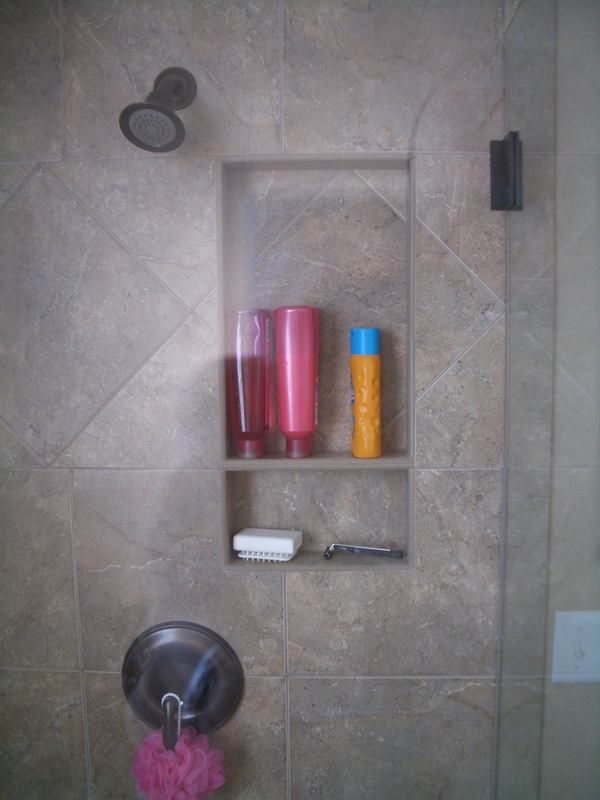 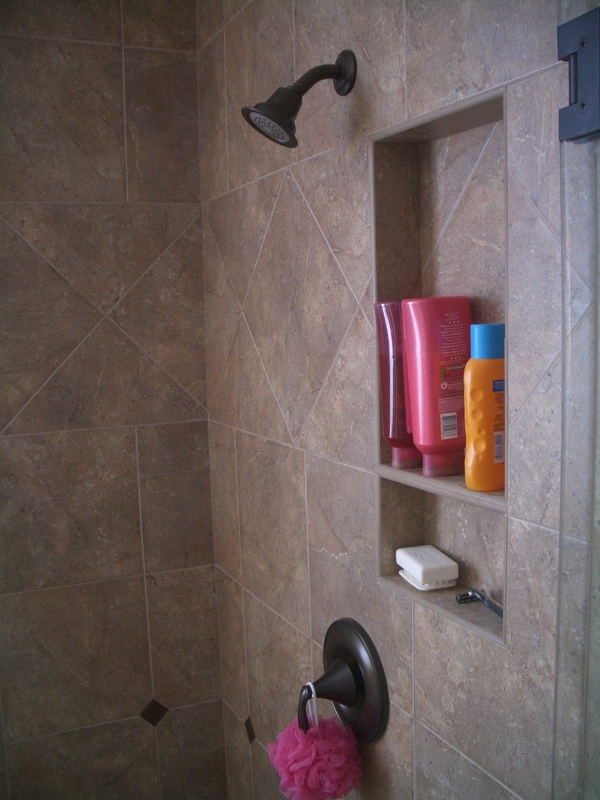 A recessed niche was built into the shower wall. 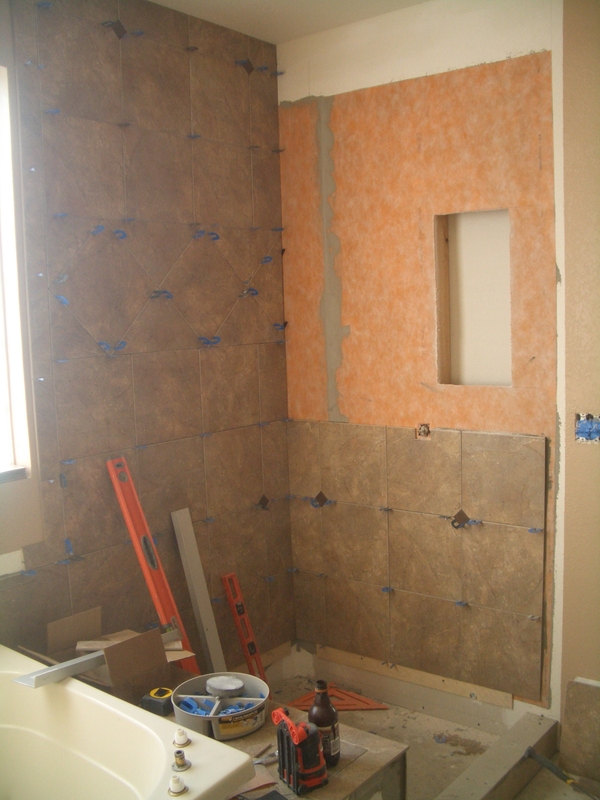 When I build a niche I will usually prep all the walls with the Kerdi and begin setting the shower walls. 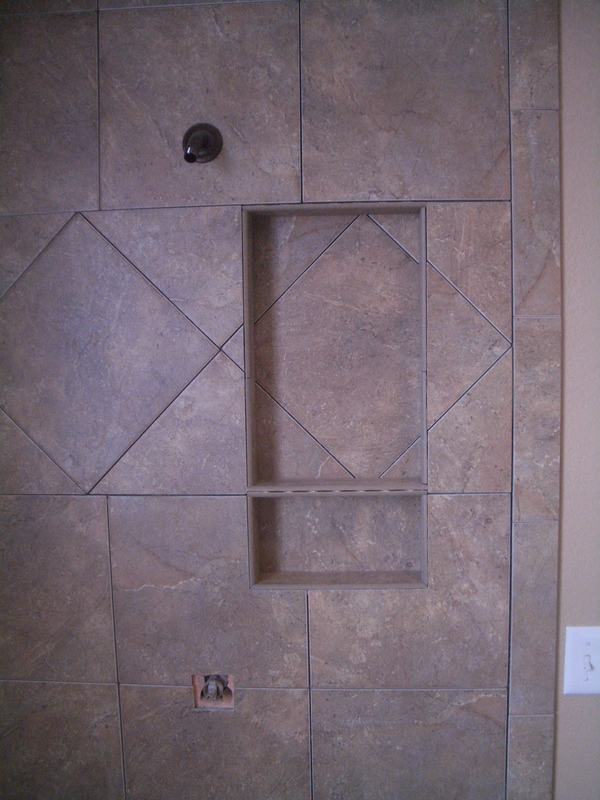 I will then stop either one or two tiles below the niche, cut it out and frame it, waterproof it, then continue tiling. 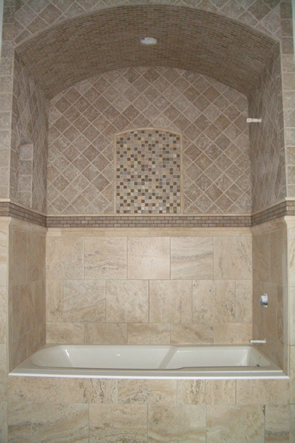 Building them in this manner allows me to control where the bottom and top of the niche end up and allow me to work the niche around the tile design rather than the reverse. 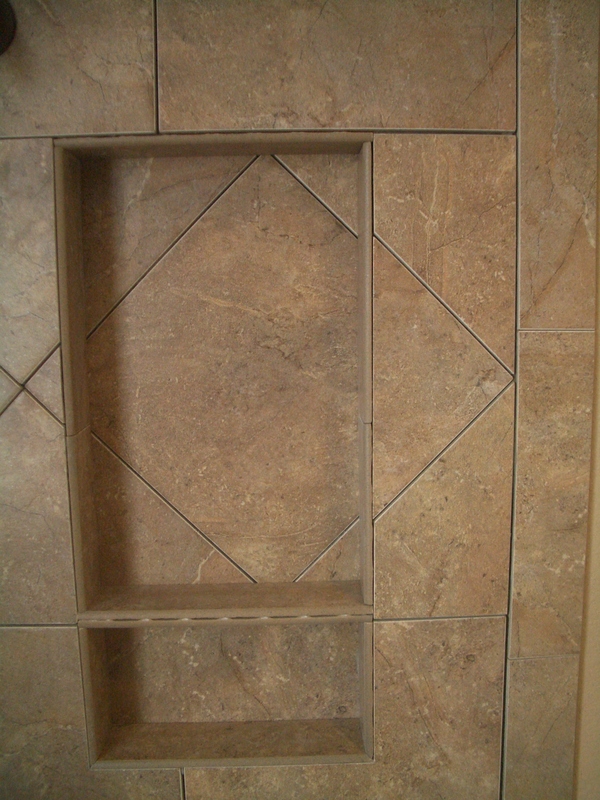 I usually want the bottom and top of niche to end up on a grout line or somewhere that it will ‘belong’ in the tile design rather than looking like an afterthought. 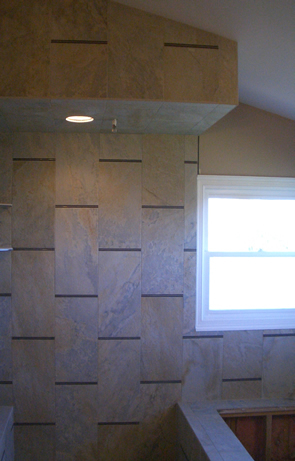 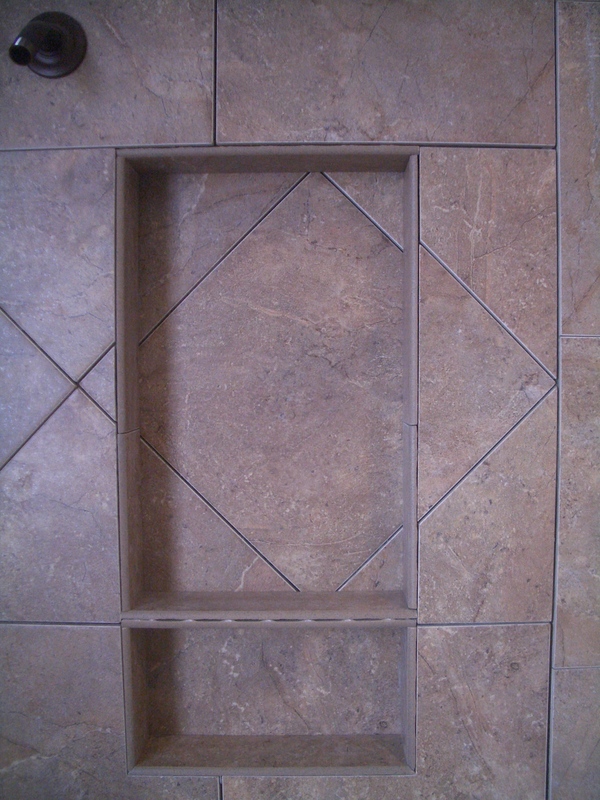 In this case the top portion is exactly the size of the row on point and the shelf above the lower portion carries the grout line across the niche. 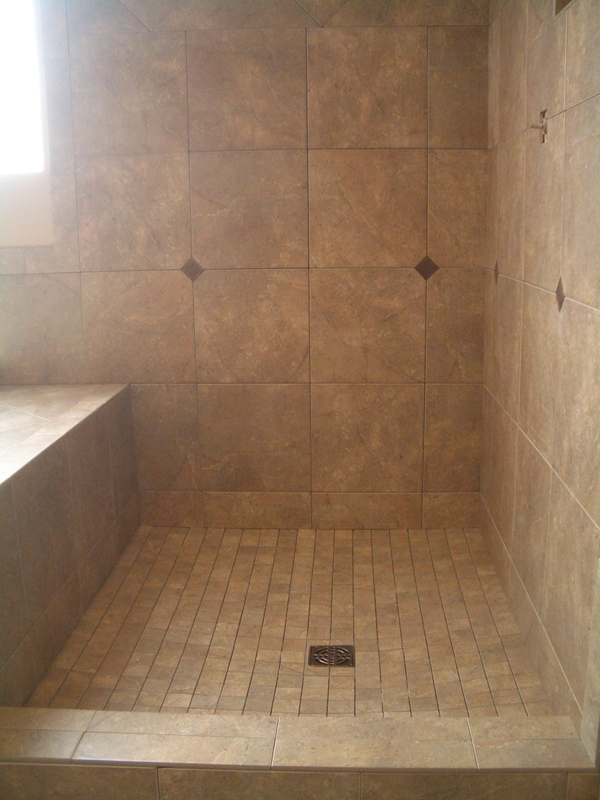 With a layout such as this the height of the tub deck must be taken into consideration so the tub’s backsplash lines up with the rows in the shower. 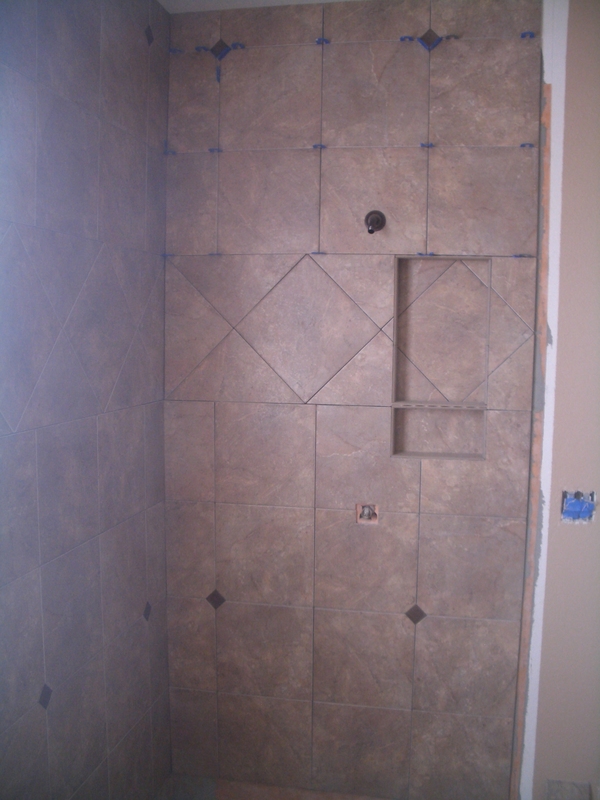 All of this must be laid out before a piece of tile is set. 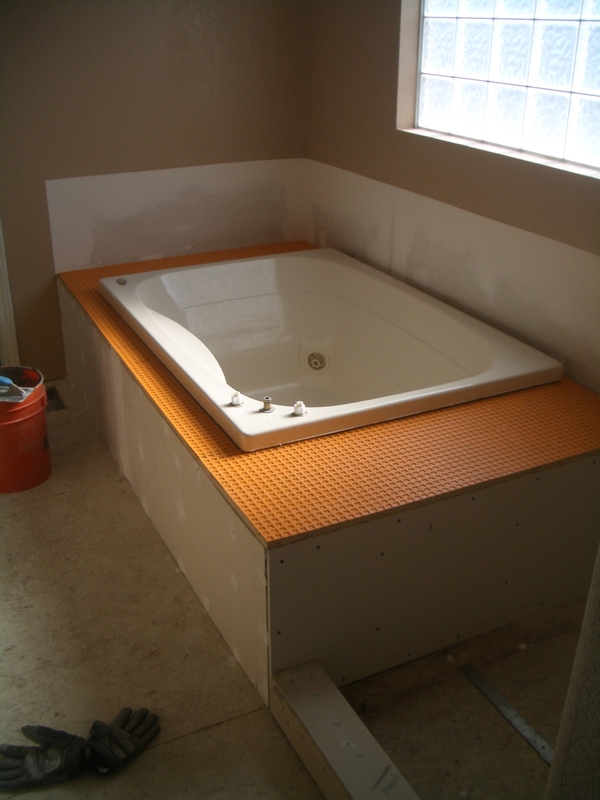 The deck of the tub was set on-point (diagonally) to break up the monotony of the layout and the face of the tub deck was installed with three tiles on-point to tie it all together. 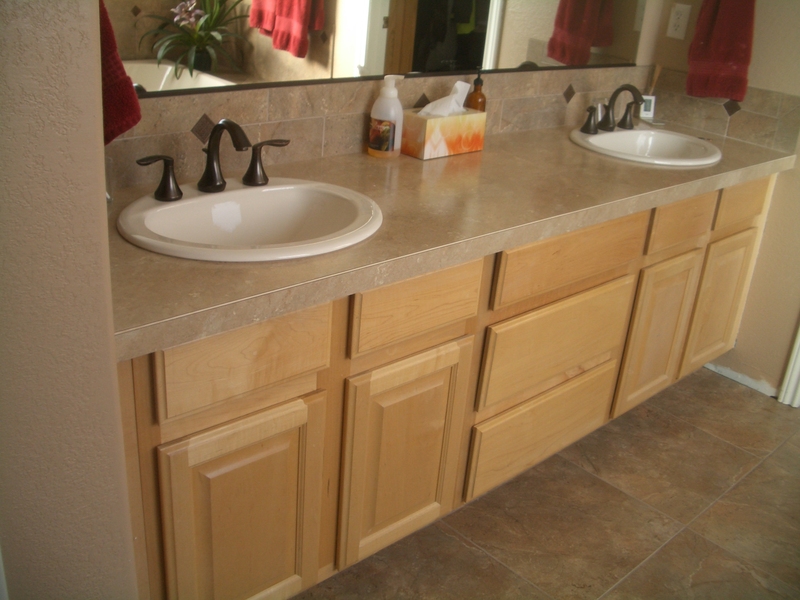 On the other side of the bathroom a countertop with a laminate that complimented the tile and a tile backsplash with the bronze inserts were installed. 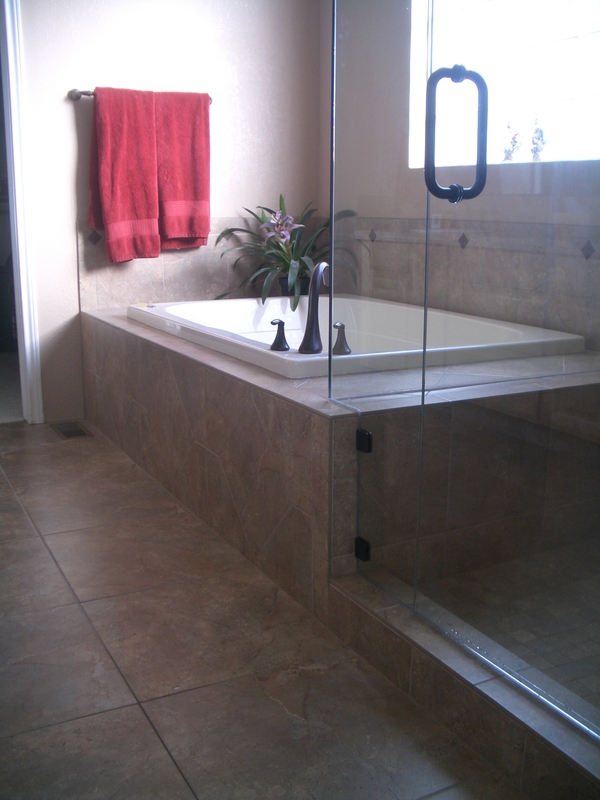 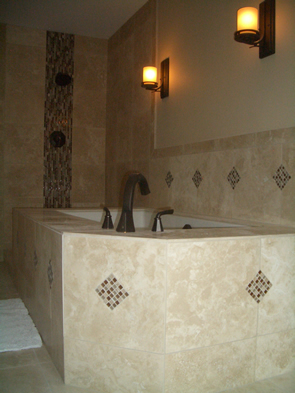 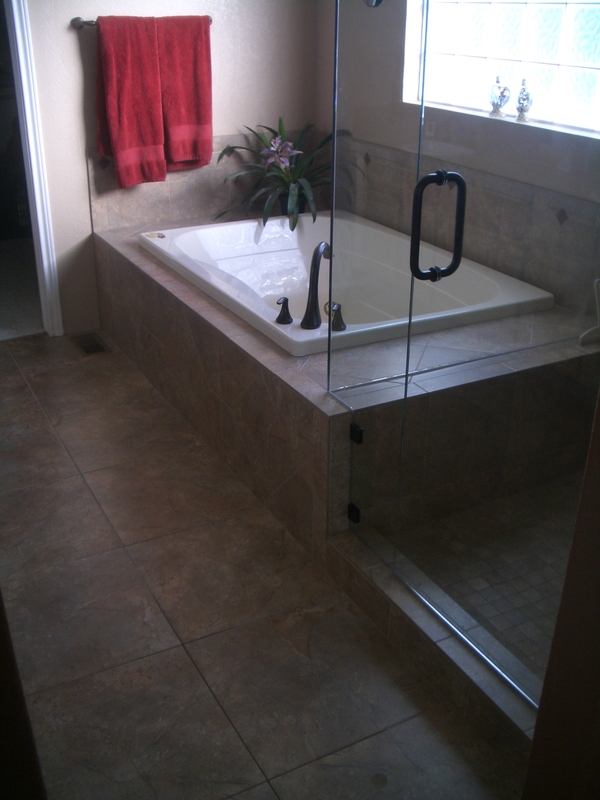 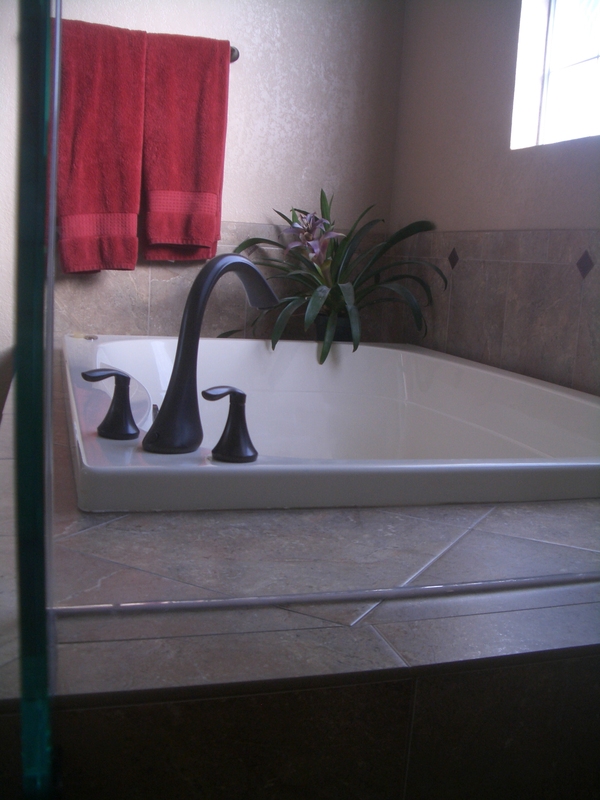 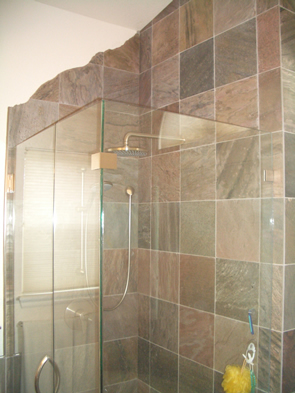 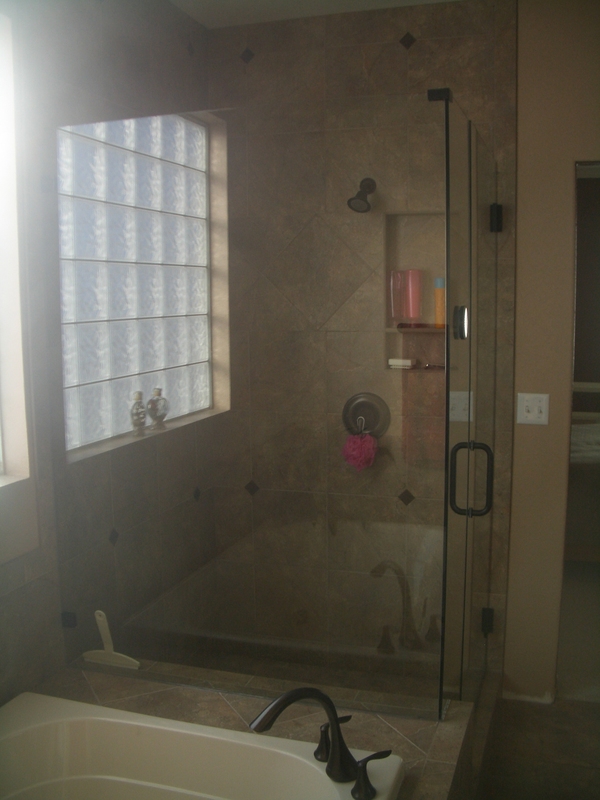 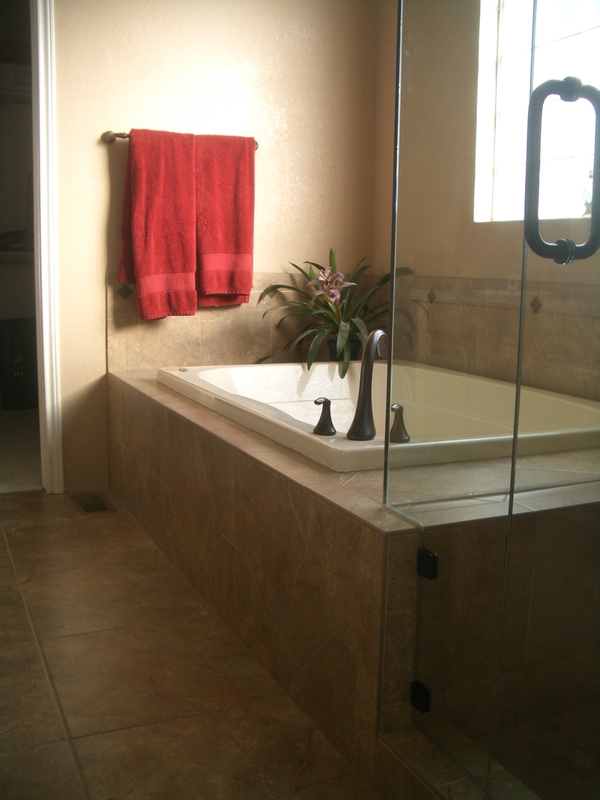 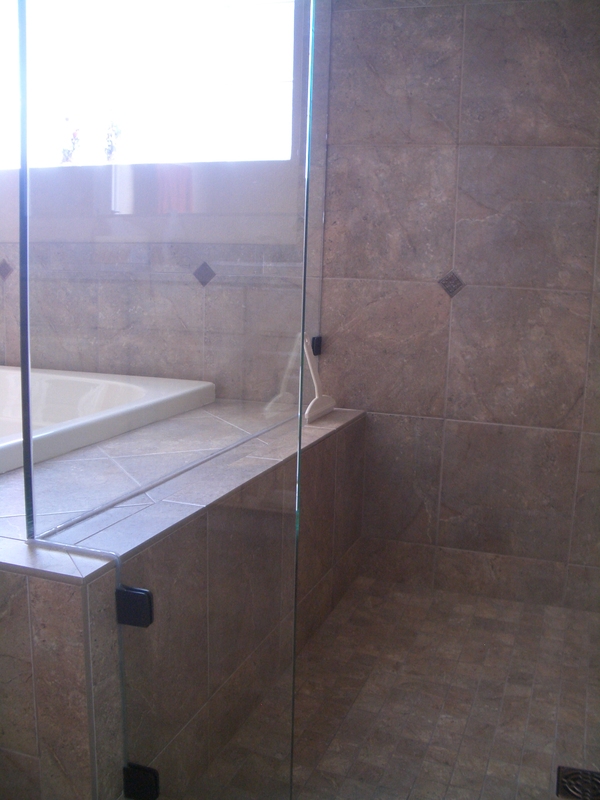 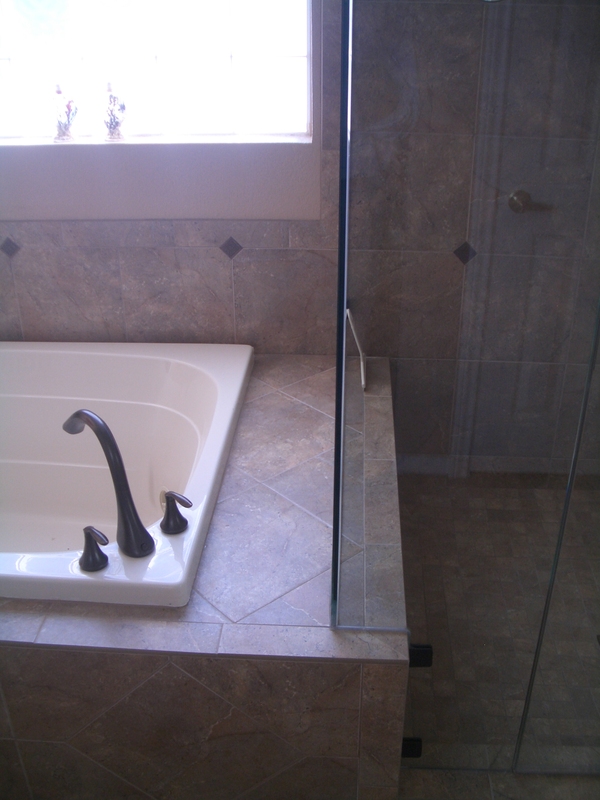 The entire bath was finished up with the bronze oil rubbed fixtures and a frameless shower enclosure. 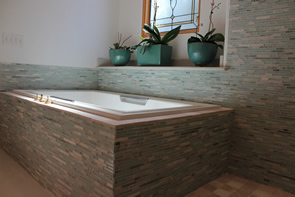 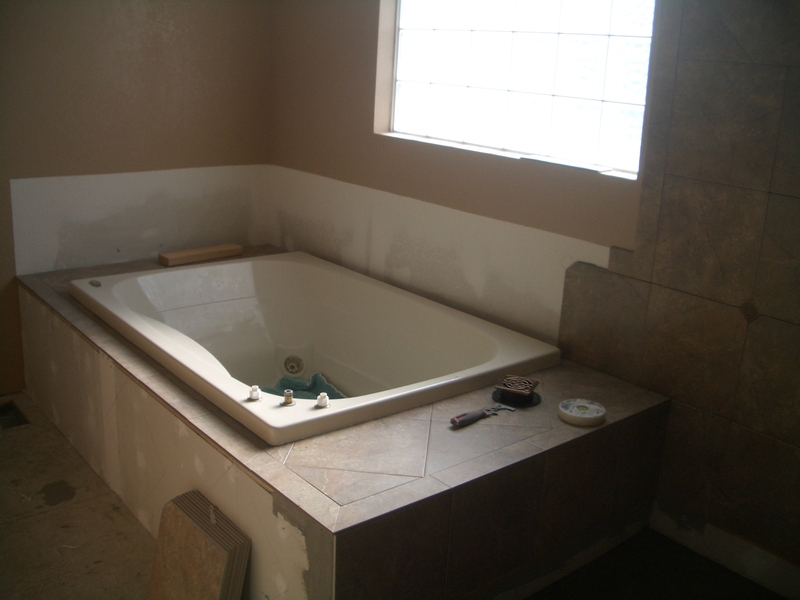 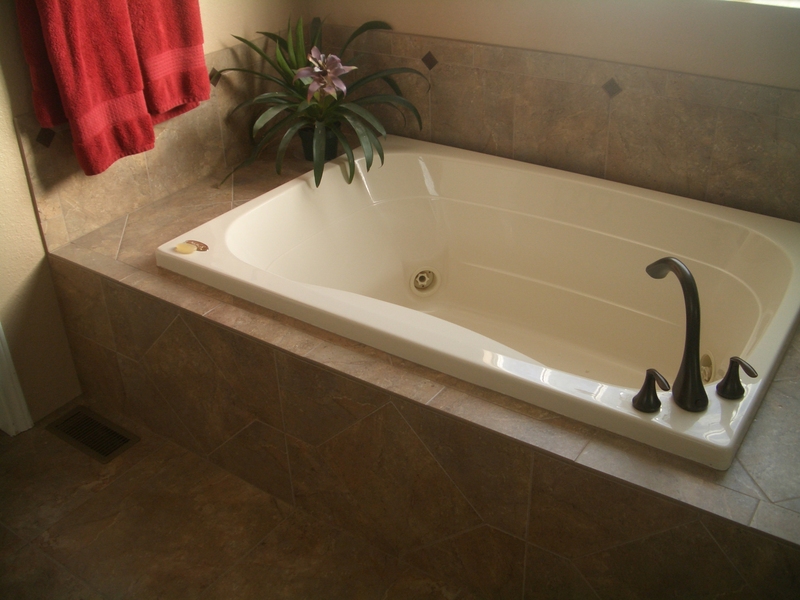 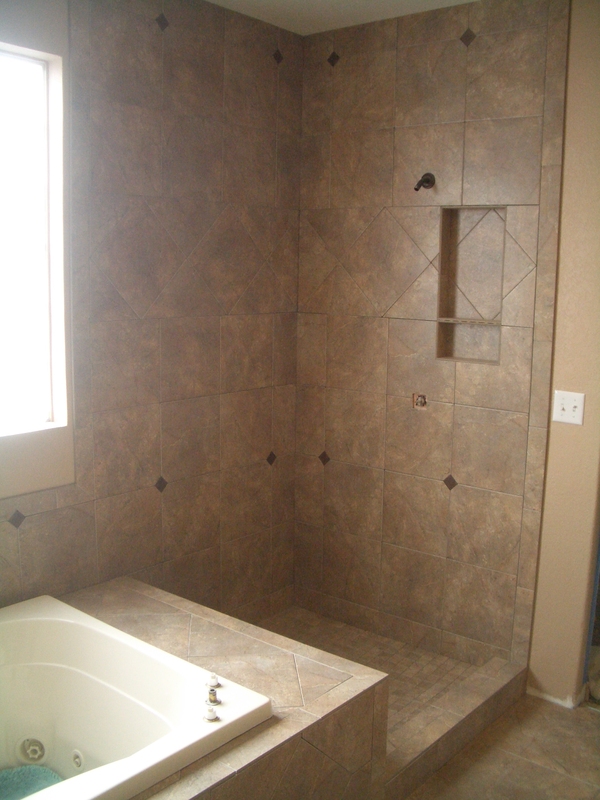 If you need a bathroom remodel in Fort Collins, or any part of Northern Colorado, just give us a call or fill out our contact form. 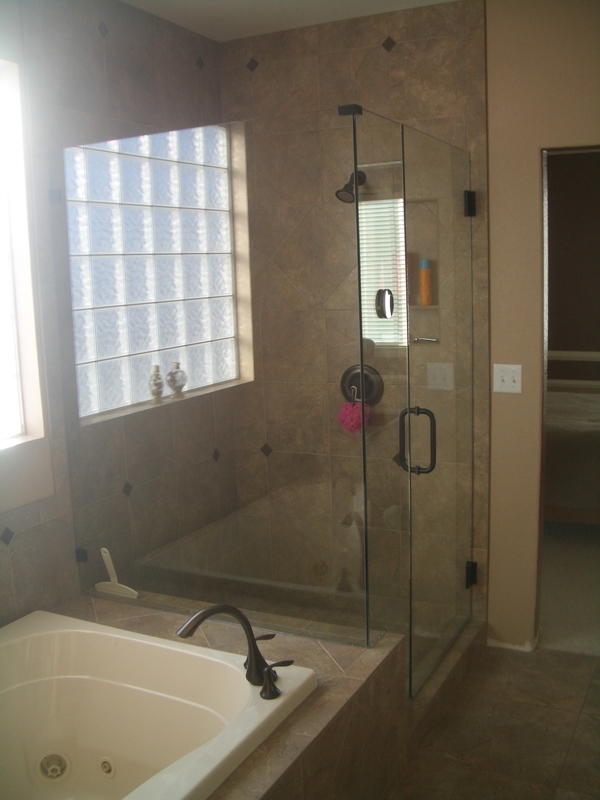 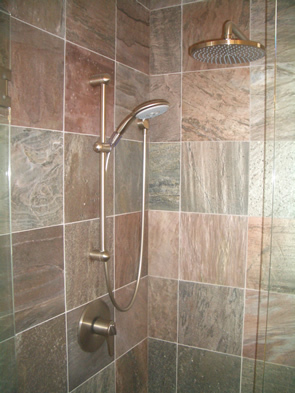 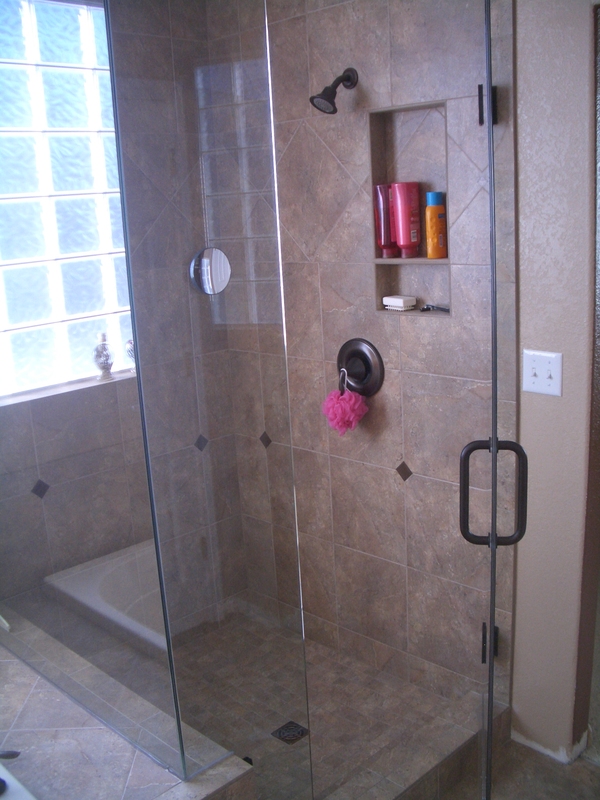 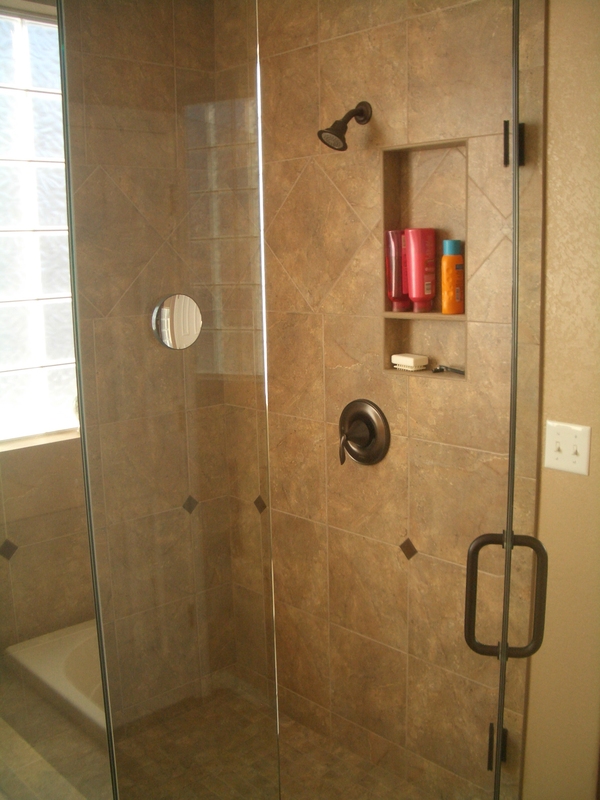 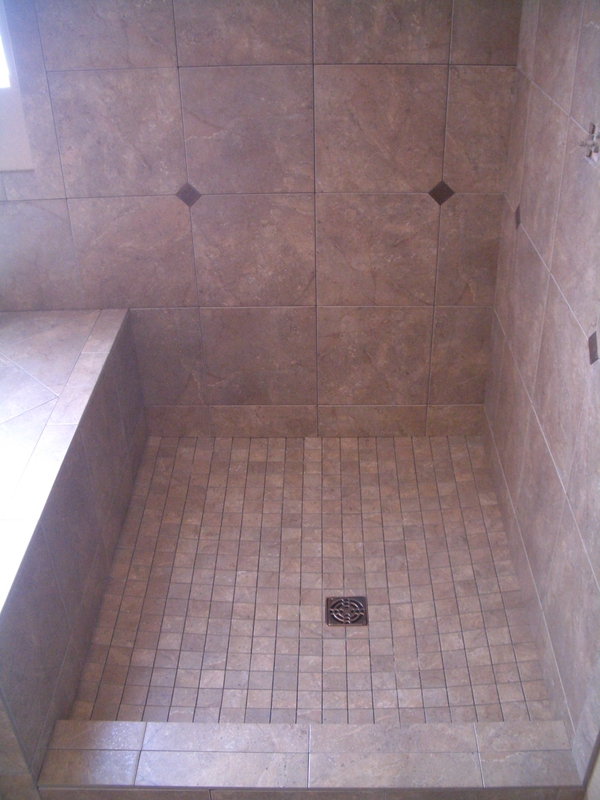 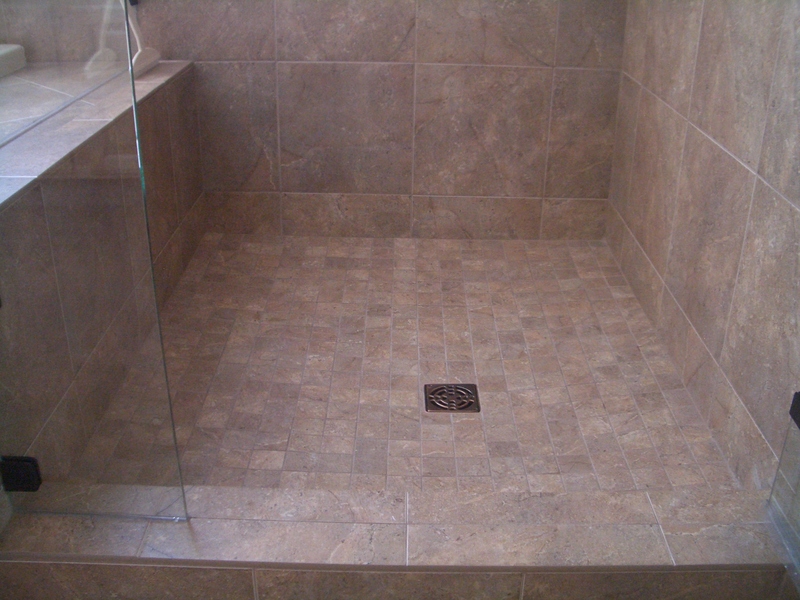 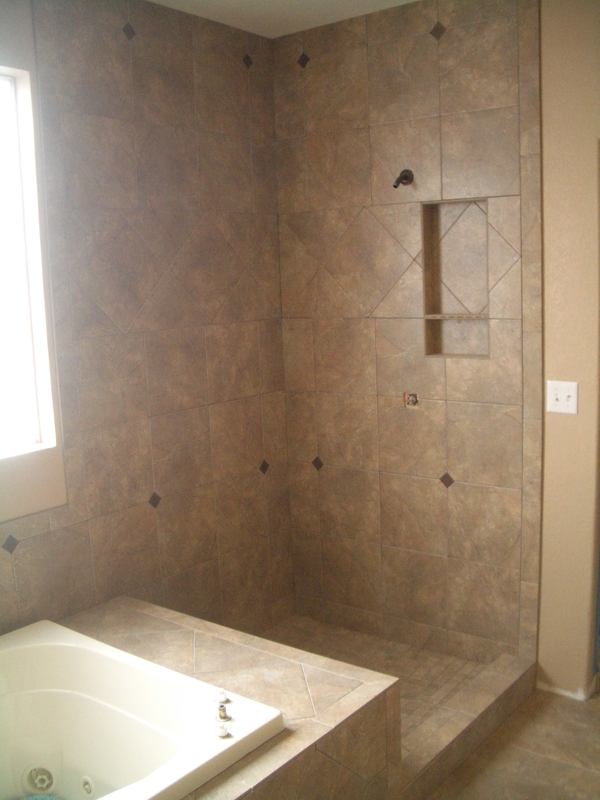 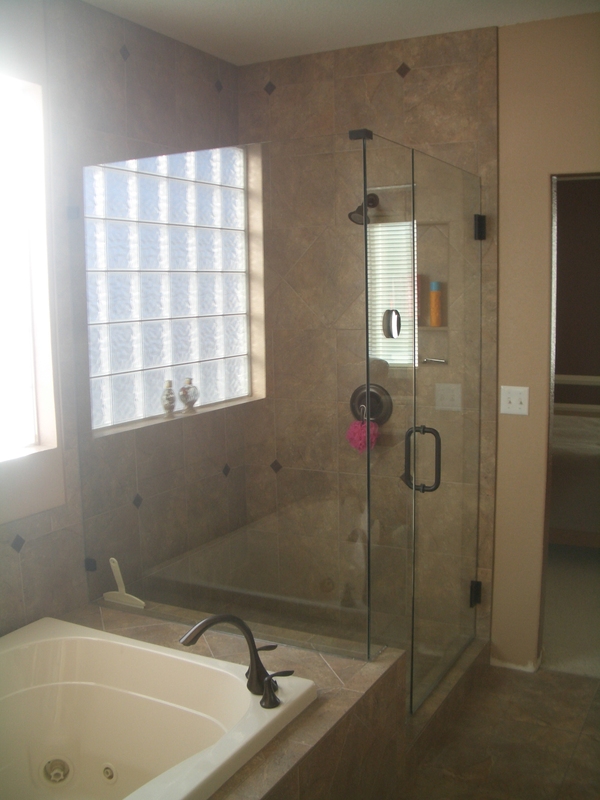 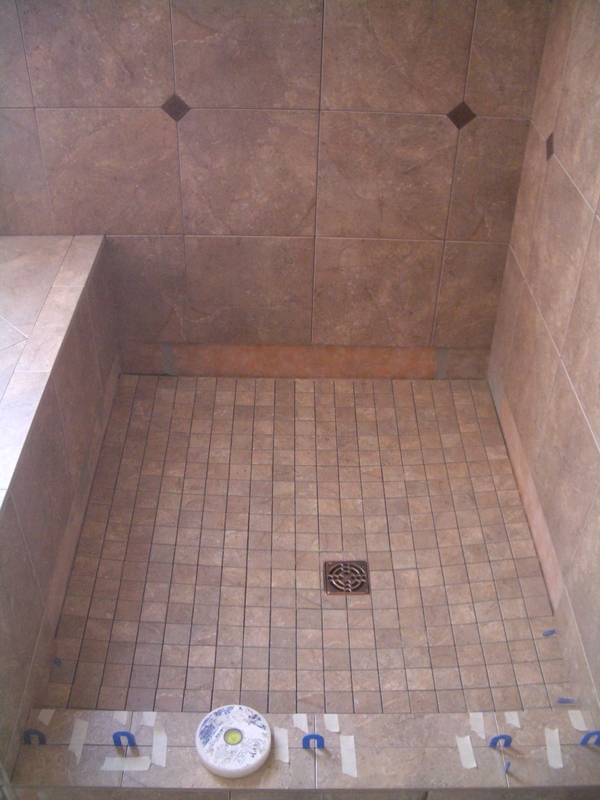 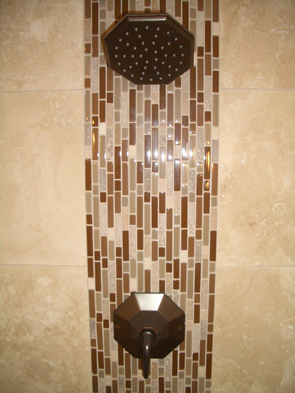 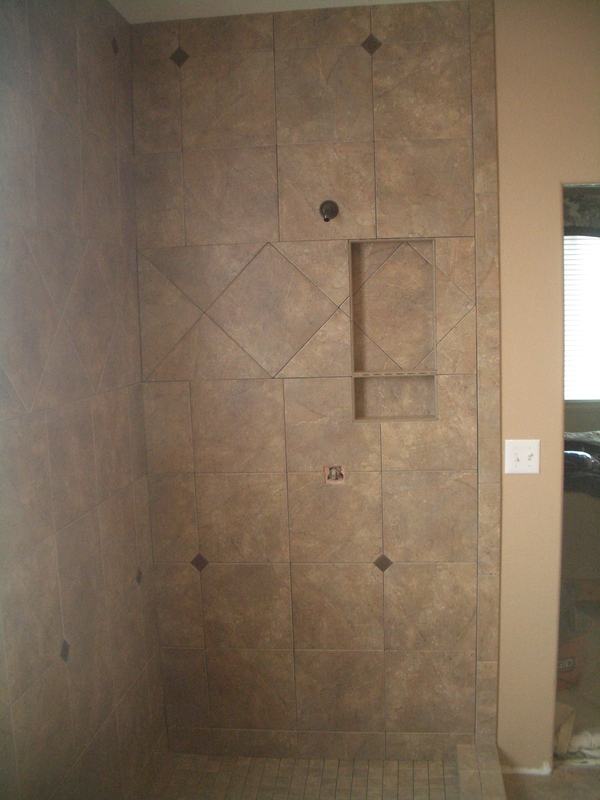 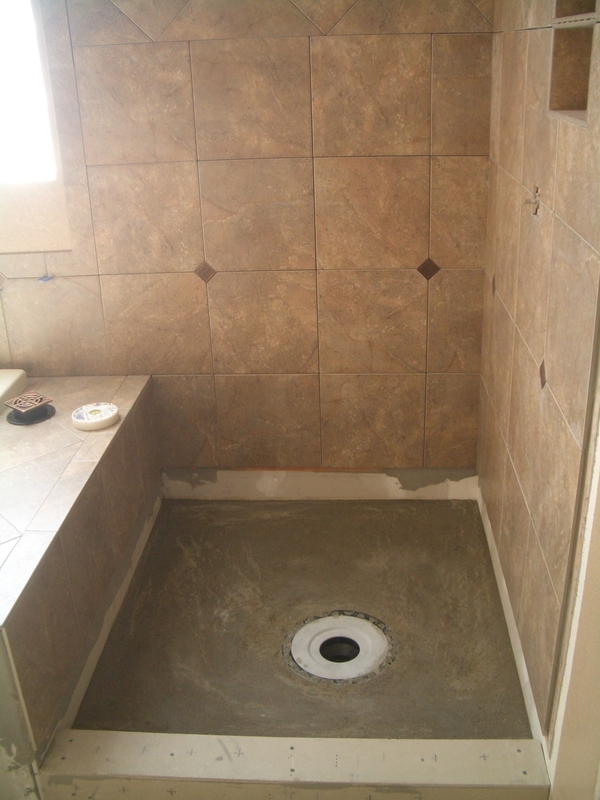 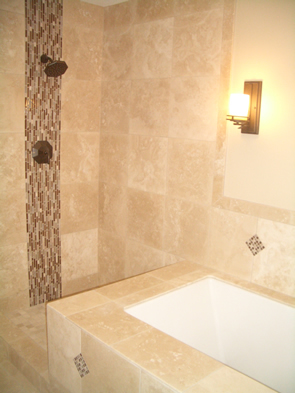 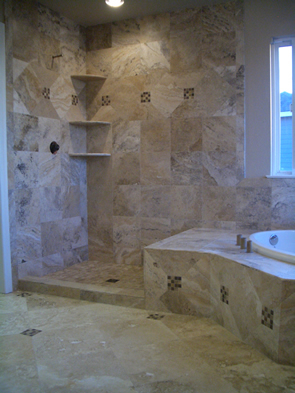 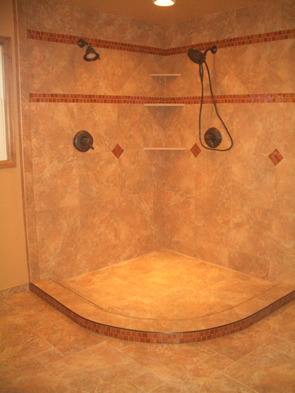 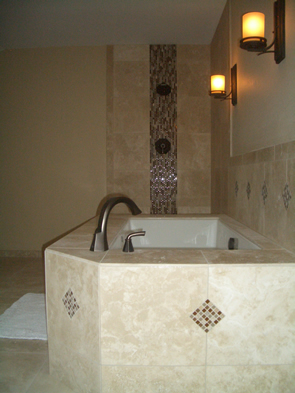 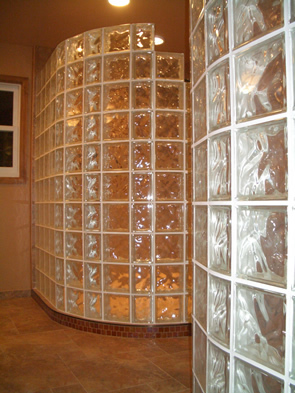 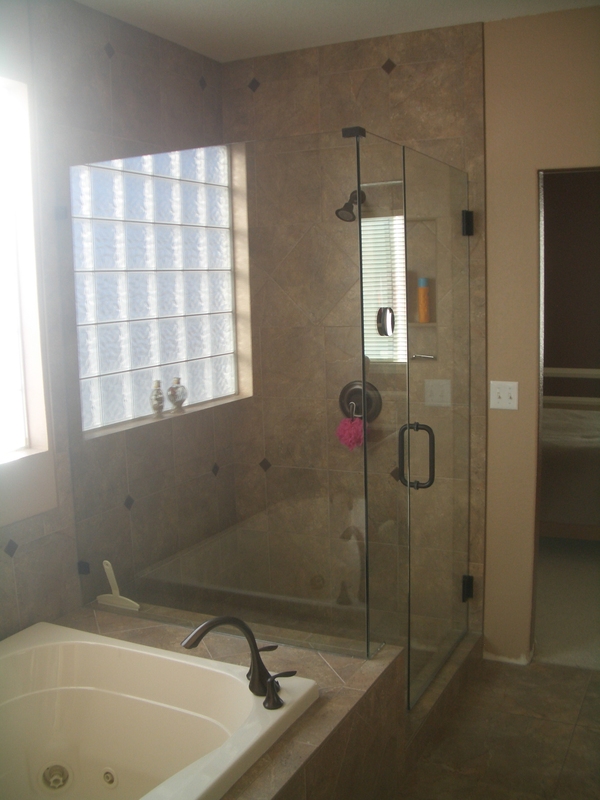 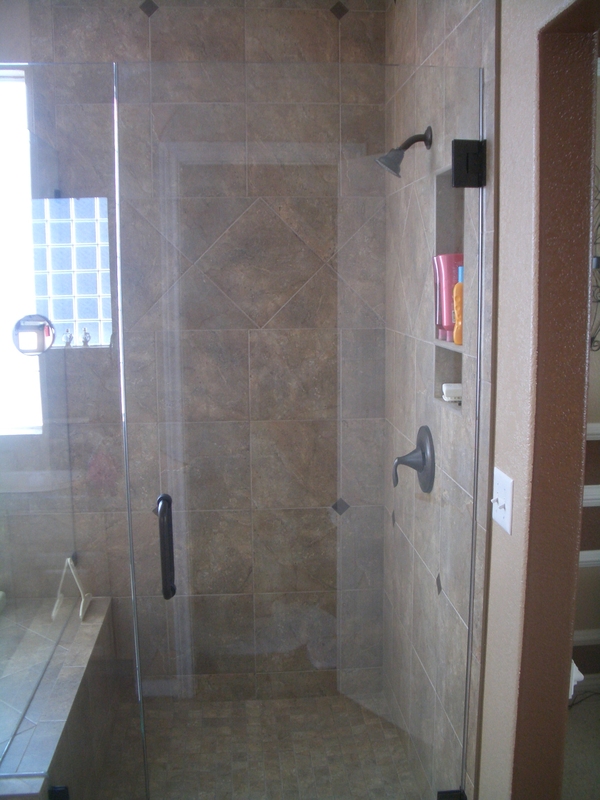 We specialize in Kerdi shower installs and guarantee an absolutely waterproof, mold-free shower. 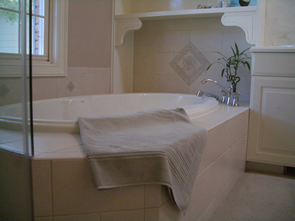 You may click on any of the photos below for a full-size version. 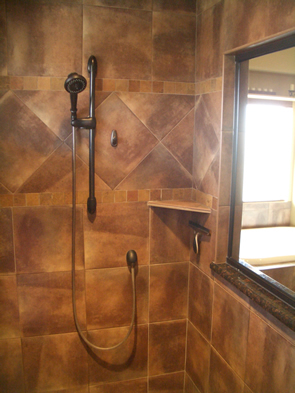 I really like that Livingston Leather tile. 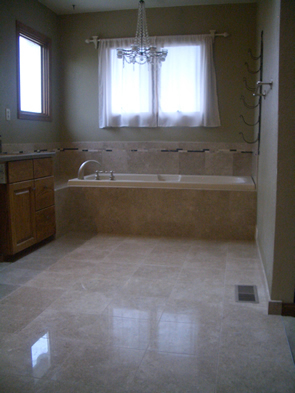 The look is great it’s a very clean, elegant looking bathroom. 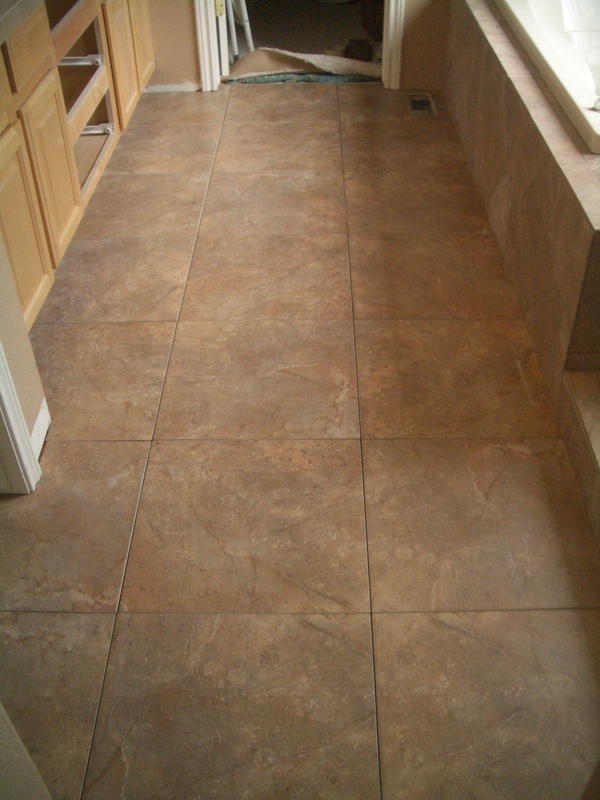 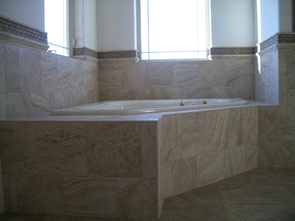 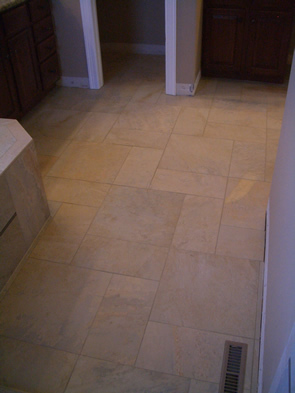 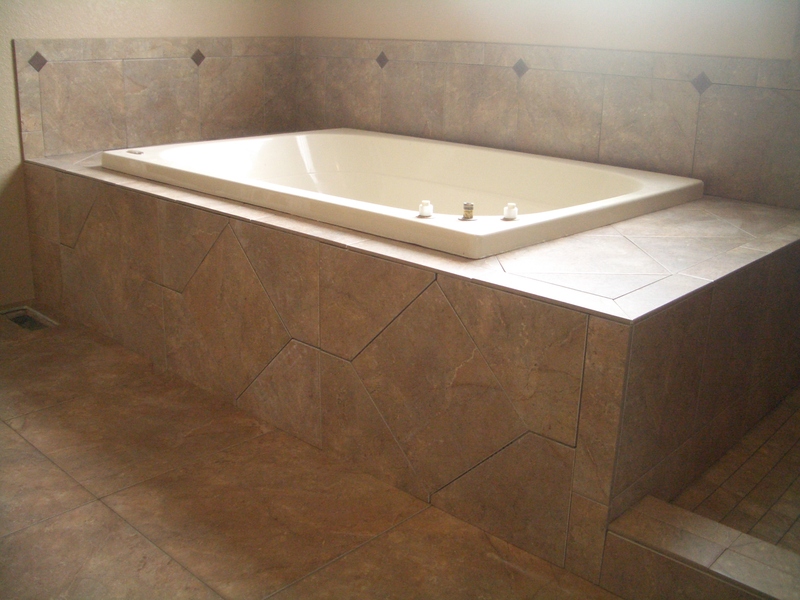 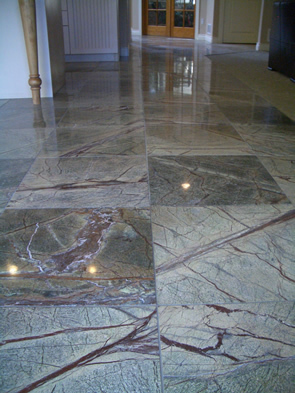 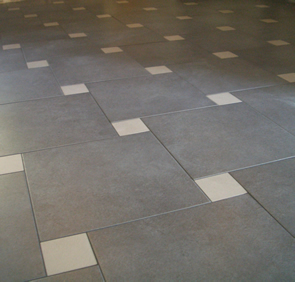 If you need Tile Installation in Temecula or the surrounding areas you can visit Chad’s website by clicking the pretty link.